Every year the Entertainment Software Association of Canada (ESAC) releases a neat document with the essential facts about Canada’s video game industry. This year’s is similar to previous years in that breaks down the player demographics and provides some serious numbers on how well the games industry in Canada is doing. 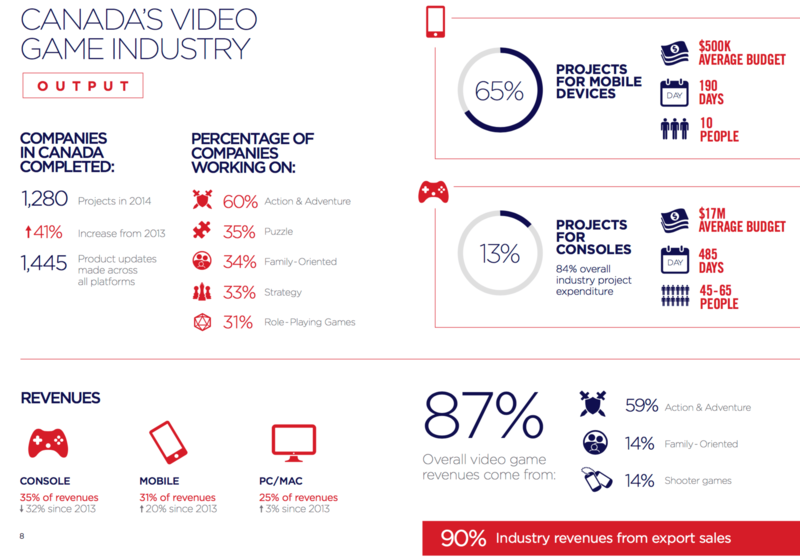 You can see the full Essential Facts About the Canadian Video Game Industry here. “Canada’s video game industry plays a positive and vital role in our economy,” said Jayson Hilchie, President and CEO of the Entertainment Software Association of Canada (ESAC). “It’s a highly skilled, highly paid industry that employs young creative people; it’s demonstrating how Canada can create jobs and prosperity, export its creativity around the world and ultimately lead in the new economy of the future,” he added. The growth experienced in 2014 is partially owed to innovation in the video game industry, including the introduction of a new generation of consoles into the market, but also other factors like huge Canadian blockbusters hitting the market, a continued explosion in popularity of mobile games (which accounted for 65% of all completed projects in 2014) and because of a positive business climate for video game developers in a majority of Canadian provinces. Companies’ outlook for the future continues to be positive, with several companies expecting the growth rate to continue over the next two years. In fact, it’s estimated that 1377 jobs will need to be filled in technical and creative roles in the next 12-24 months. Using games to visualize the past is nothing new, but there are good and bad ways of doing so. There is technology for augmented reality historical vexing (which can be problematic); when mainstream games try their hand at history they also run into issues. I’ve tried my hand at making historically-grounded games (read about mine here) it can be a challenge balancing playability with historical accuracy. Circa 1948 (App Store) is an interactive story for iOS that captures life in the city of Vancouver in 1948. It’s an NFB project examining two communities in Vancouver that no longer exist. The work is noteworthy as it goes beyond being just an interactive story on the iPad. Gamesuace interviewed the lead designer, Kelly Richard Fenning, about what it was like making the app from a technical and historical perspective. Their development process was haphazard and chaotic, but hey, they shipped! In order to make the historical aspects engaging for gameplay they had to make some modifications. Nothing out of the ordinary, but in my experience some teachers fail to realize that sometimes accuracy needs to be sacrificed for engagement (it’s very easy to discuss these accuracies after the game). As for the characters in the app, nearly all of them are fictitious. That being said, we were able to interview many people who were alive in these communities, and they shared stories about some of the more “colorful and notable” people and events of the time. From these stories, Douglas worked with screen-writer Chris Haddock and playwright Kevin Kerr to create some original characters and situations that were amalgams of these stories. In addition to the app, they wanted to create a multi-contextual experience around it, so the Circa 1948 Storyworld is not just the app, but also a historically informative webpage, a Stan Douglas photo series, the immersive projection-map installation (as featured at TriBeCa and touring major cities), and the stage play of Helen Lawrence itself. (Although not a film as originally intended, Helen Lawrence became a ground-breaking play where stage actors were filmed against blue screen and composited and shown to the audience in real-time into the digital environments we developed for the app).